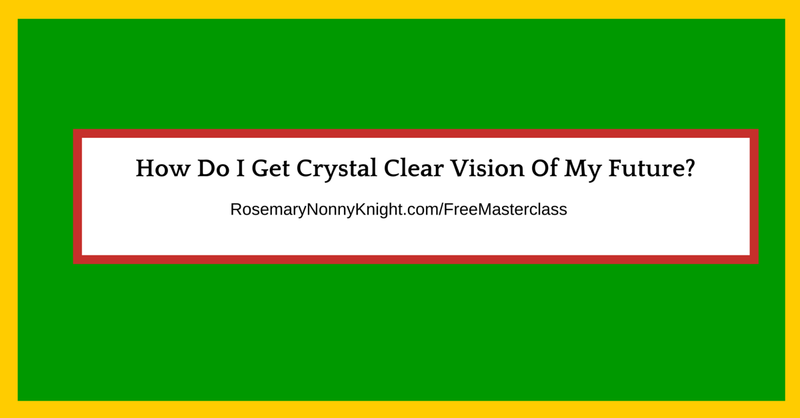 How Do I Get A Crystal Clear Vision Of My Future? On many occasions, I speak to people and realize that they have not got the foggiest idea about what they want to make happen in their lives or even in their businesses. They are just going through the motions, doing what they have always done and hoping that it all works out okay in the end. There is no deliberate decision to create what they want because they are convinced that they do not know what they want and so they have stopped asking the question. Not wanting to generalize, I think that people in this situation have lost some hope of ever getting what they want and so now they feel they do not know what they want. Is it true that they do not know what they want or are they blocking parts of themselves to avoid disappointment? Whatever it is, a crystal clear vision of your future enables you to ensure that each of your actions are targeted and focused on delivering the life and the business you want. As human beings, we are above the animals in that we are able to think and so we need to use our brains in the way they are designed. So how can you get clarity and wake yourself up again to the potential? YOU do it by using questions and a journal. Now I know some prefer to type but I personally find that the action of putting pen to paper has an even more clarifying effect. Of course that could just be my opinion. What Do I want? Simple, I know and yet you never know what may come up as a result of such a simple question. If I had no limitations, what would I do each day? Initially, there will be thoughts of doing nothing at all, especially if you are currently trapped in a job that you really do not like. But take it further than that. When I have had my fill of doing nothing, then what would I want to do? Ask yourself these three questions and let yourself settle into flow. This is not something you do in double-quick time… This is something you do slowly, surely and allow the words to bubble up within you and you just write, write, write. Let the surface stuff out and let the real things come through. OK, I am going to keep it this simple – Take your time and answer those three questions and see where it takes you. The answers are always within you.